The Amazon river is the second only to the Nile as the longest river in the world, stretching 6296 kilometers from its origins high in the Andes Mountains of Peru, Ecuador and Columbia. The Amazon runs through Peru and Brazil to its mouth in the Atlantic Ocean near Belém in Northern Brazil. Although second in length, it carries more water than any other river including the Nile, and is responsible for 20% of the fresh water carried into the oceans, more than the next seven largest rivers combined. The confluence of the Marañon and Ucayalli rivers is the area usually considered the start of the Amazon River proper. The Amazon River has more than 200 tributaries. Some of the tributaries flow in to the Marañon and Ucayalli Rivers, others empty directly into the Amazon River. Having the largest watershed (area of land that flows into the river) 7,050,000 square kilometres (2,720,000 sq mi), the Amazon basin occupies about 40% of the land area of South America. It drains from Iquitos, Peru in the west, eastwards across Brazil to the Atlantic ocean. The largest city on the Amazon is Manaus in Brazil, home to almost 2 million people. The second largest is Belém. 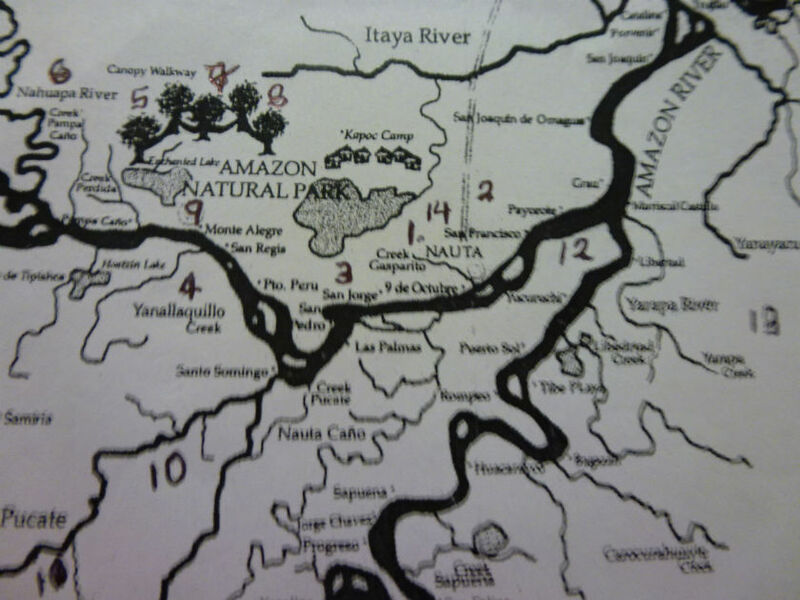 The area we visited was the Peruvian Amazon. We flew into Iquitos and traveled overland to Nauta, a small town on the bank of the river near the confluence of the Marañon and Ucayalli. The giant tropical Amazon rainforest is home to one-third of the known fauna species in the world and over 3000 species of fish have been found in the river. There are between 30 and 60 species of piranha. We think of piranhas as fearsome man-eating fishes. But as you read in my introduction, instead of a piranha eating me, I ate it. The river is also home to river dolphins, manatees and reptiles such as the anaconda, the caiman and river turtles. In a week it is only possible to visit a very tiny part of this vast river basin. Our journey on the Peruvian Amazon began and ended in Nauta. 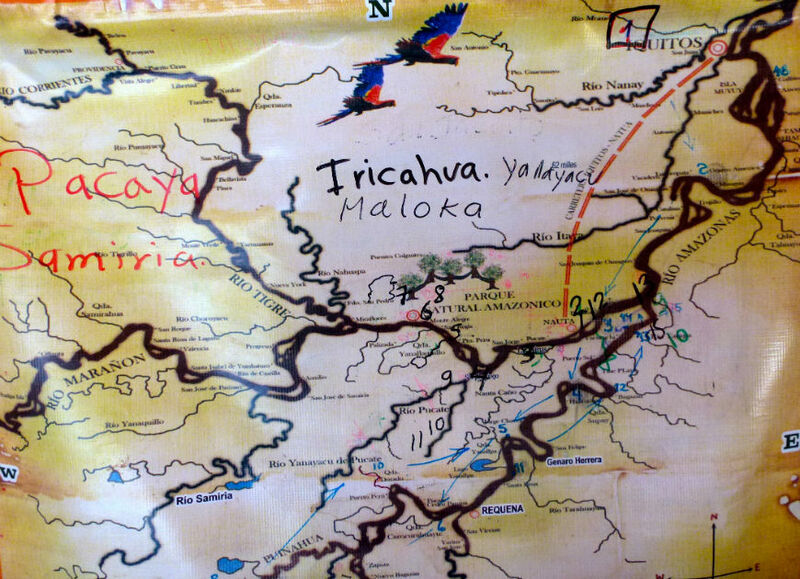 The map on the right shows the 10 different excursions we took to explore areas in the Pacaya-Samiria National Reserve. We traveled by skiff and by catamaran to reach areas along the tributaries and creeks impossible to access even in a riverboat, never mind even a small cruise ship. A jungle hike with an overnight stay in the Kapok camp was both a highlight and a "lowlight" as you will read later, but I can truly say I have hiked through and slept in the Amazon rainforest jungle. Not bad for that luxury loving urbanite with a phobia about flying insects.